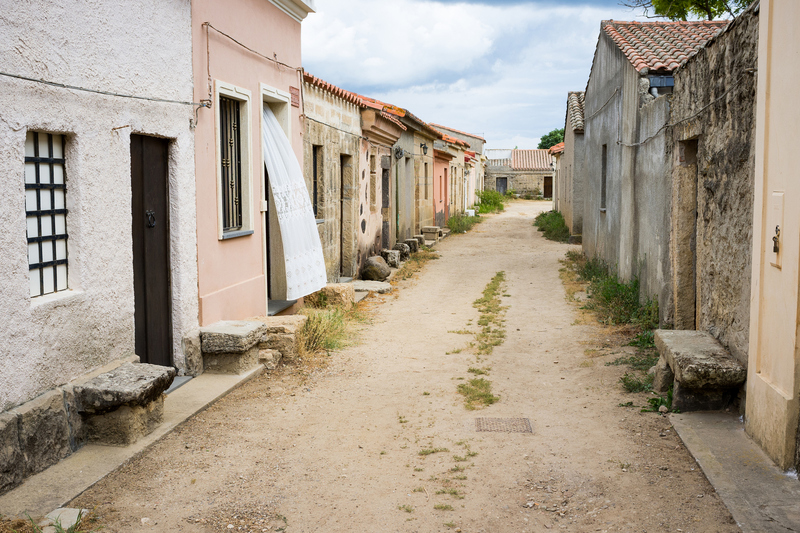 The Sardinian Far West consists in a village inhabited only a few days in September, during the Corsa degli Scalzi – a barefoot-running event. San Salvatore di Sinis, a fraction of Cabras, along a nine-kilometre stretch of road leading to the beautiful beach Is Arutas and the ancient city of Tharros, is a small village built in an area that has been sacred since the Nuragic age. It was transformed for over two decades (1967-1090), into a set for filming ‘Spaghetti Westerns’, due to the resemblance to the landscapes of the American frontier. It was thus used by film producers to become a village of Arizona or New Mexico (saloon included) in films such as ‘Garter Colt’ (1968). A scenography in the 20th century, after having been a place of worship for thousands of years. The medieval village, whose current appearance dates back to the Spanish domain, owes its name to the Church of San Salvatore, constructed in the second half of the 17th century, built on a prehistoric sanctuary carved into the rock. Under the left aisle is a hypogeum that shows evidence of having been frequented as far back as the Neolithic period, with access via a small staircase. A series of rectangular and circular rooms (one with a well) leads to the main room with a spring source, having been used for the pagan worship of waters in the Nuragic age. Then, in the Punic era, the area was dedicated to the healer god of Sid, and in its wake, the Roman practice of the cult of Asclepius. The Romanisation of the ghost-village is completed by Domu ‘e Cubas, the ruins of baths from the imperial age with a polychrome mosaic floor, and traces of a granary (2nd century BC). 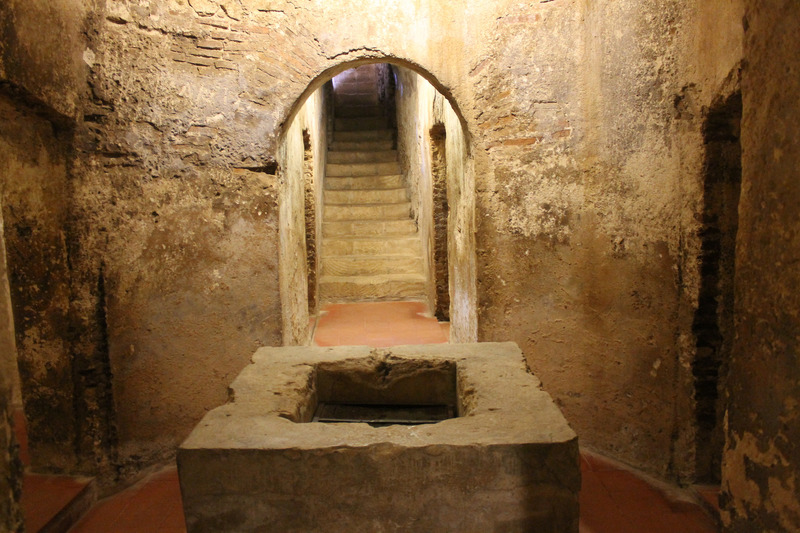 From the 4th century, the hypogeum was transformed into an early Christian sanctuary in honour of the Saviour, as can be seen by two rooms with rough altars with a large Nuragic basin to the sides, reused as a holy water font. On the walls of all the rooms are Punic, Greek, Latin and Arabic inscriptions that possibly date back to attacks from Islamic marauders in the Middle Ages. Splendid early-Christian frescoes are to be admired along with graffiti and decorations that can be attributed to scenes of daily life from the Roman era and pagan cults. 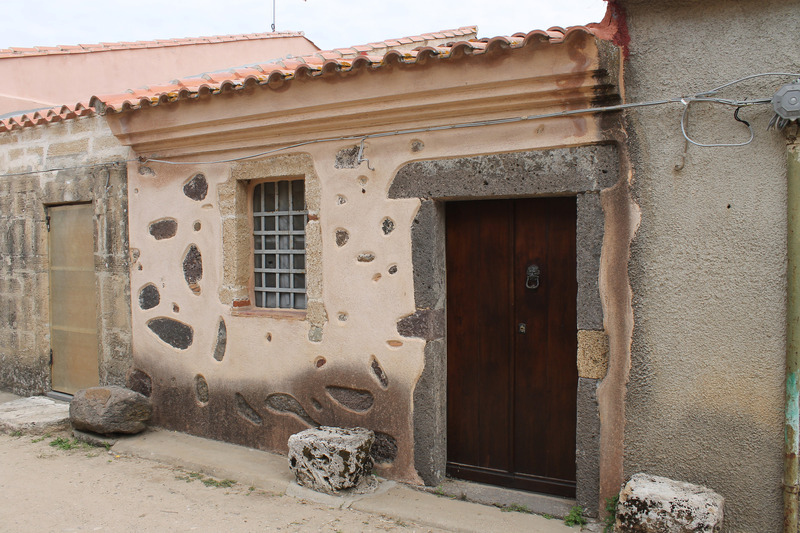 The church is surrounded by sas cumbessias, small and unadorned houses built at the end of the 17th century and used as accommodation for pilgrims during the novena prayers in honour of San Salvatore, between August and September. 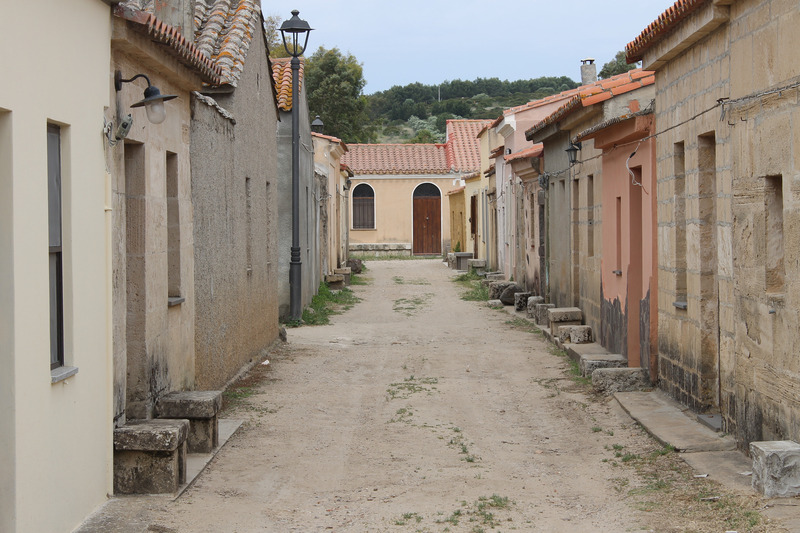 In the twenty-year ‘cinematic period’ of the village, these were an integral part of the western scenography. 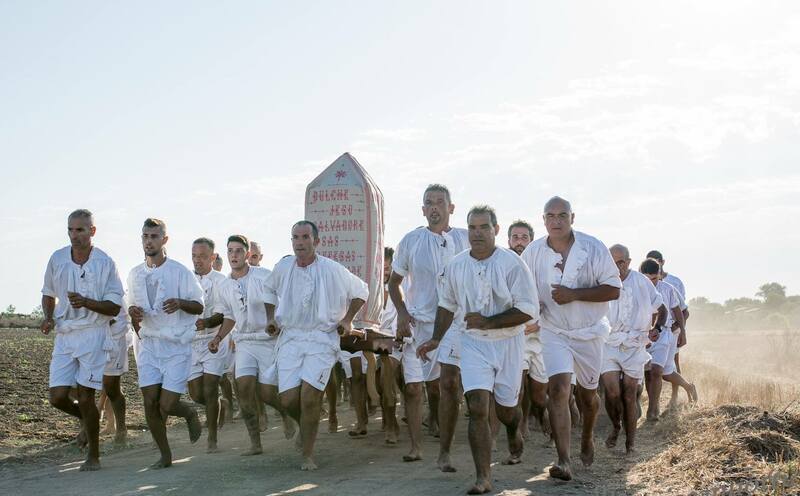 The highlight of the celebrations commences at the dawn on the first Saturday of September with the Corsa degli Scalzi, one of the most evocative and heartfelt identitary events in Sardinia. 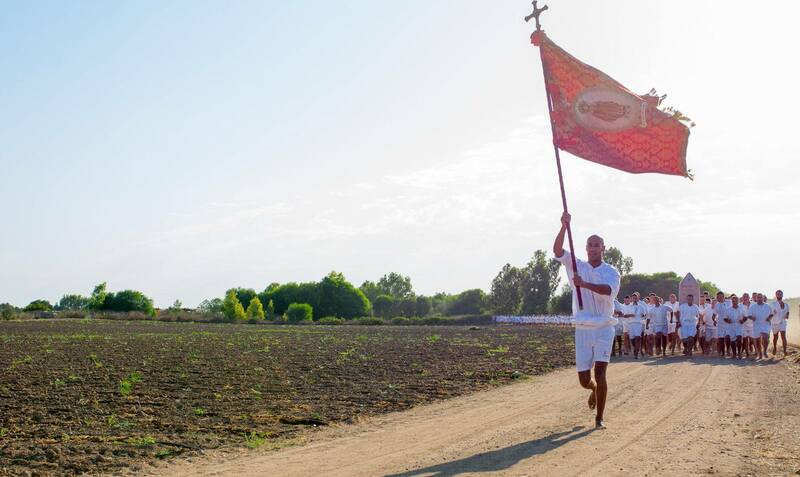 The procession involves over 800 curridoris in white tunics, running barefoot along a long dirt road following the simulacrum of the saint from the Church of Santa Maria Assunta in Cabras to the township. 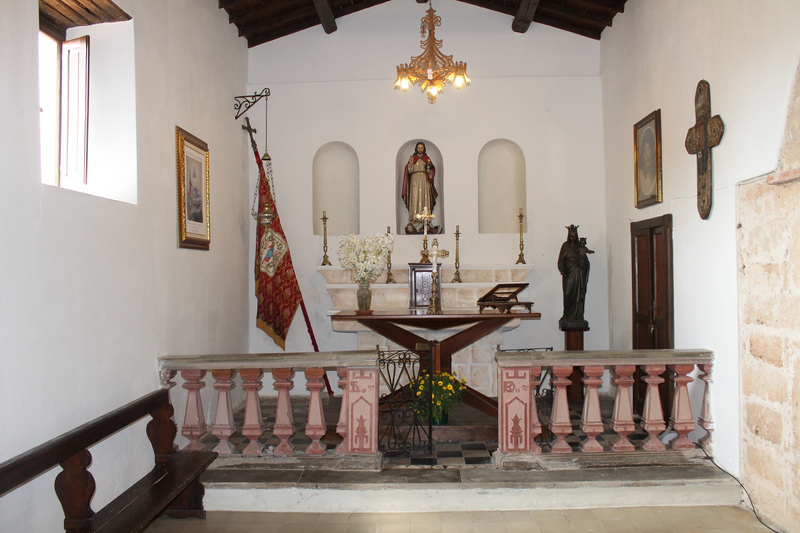 The simulacrum is then returned to the parish church the following day.